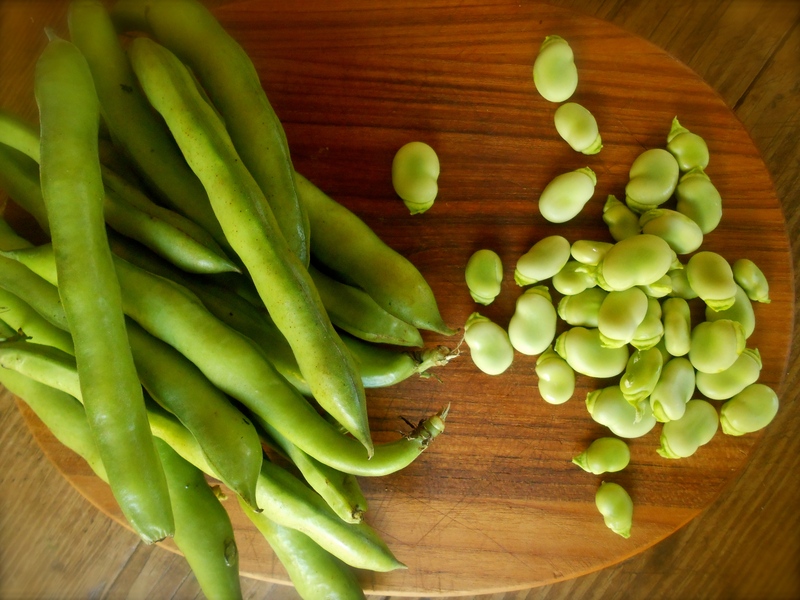 I began my seasonal hunt for fava beans when I came across this hot yogurt and fava bean soup recipe from Yotam Ottolenghi. The first sighting of fava beans is always a sign warmer weather is upon us. And indeed it is. We have had 80°F temperatures for the past two days. Seattle does not have extreme weather. We don’t have sweltering heat in the summer or freezing temperatures in the winter. I have heard our fine city referred to as a best kept secret because of the mild temperatures and tolerable seasons. And with that, and a little rain (ok, a lot) comes an abundance of farm fresh foods. I have this personal tradition of preparing a spring soup every year at the start of spring. This is my way to welcome in the season and all its glory. This year I decided on a heavily ladened herb soup. The fava beans in this soup are pureed with the yogurt and long-grain rice until smooth and creamy, which really is a wonderful base. 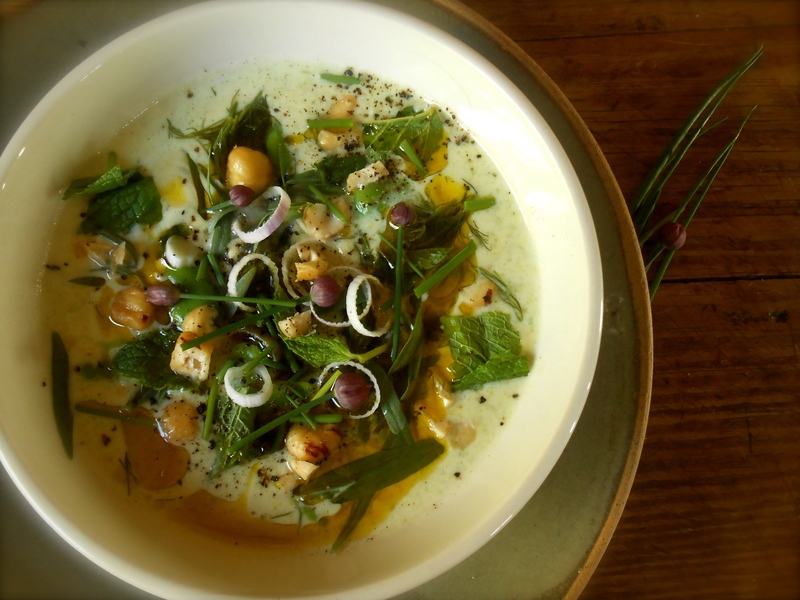 However, a base sometimes needs something on top and after adding fresh herbs, hazelnuts, spring garlic and asparagus tips the soup becomes unforgettable. I hope I’m not too late for Fiesta Friday #14. I could really use a party today. And with Saucy and Johnny hosting, no way was I going to miss this one. It’s still gin o’clock right? Ok, where is the blackberry gin fizz? Prepare an ice water bath. Bring a large pot of water to a boil. Drop in the shelled fava beans and cook for a minute or two. Drain. Immediately transfer the beans to the ice water bath. Remove the skins by gently pushing your fingers against the sides of the bean (the favas should easily slide out). Place into a bowl. Set aside. Heat the vegetable stock in a large soup pot. Add the rice, bring to a boil, then lower the heat, cover and simmer for 20 minutes or until the rice is tender. Add half of the fava beans. Season with salt and pepper, and using a hand blender, blend until completely smooth. In a separate heat-proof bowl, whisk together the yogurt, crushed garlic, and egg. Add a ladleful of the hot soup and whisk together. Continue adding the hot soup slowly, until you’ve mixed about half of the soup into the egg mixture, do this slowly so the yogurt doesn’t split due to differences in temperature. Pour the tempered yogurt back into the pot with the remaining soup. Place the soup on medium heat until warmed through. Make sure it doesn’t boil. Season with salt and pepper to taste. Ladle the soup into four shallow bowls. Evenly scatter the remaining fava beans on top. Garnish with fresh herbs, lemon zest, sprinkling of chopped nuts, a drizzle of extra virgin olive oil, and a squeeze of lemon. You are currently reading yogurt & fava bean soup at COTTAGE GROVE HOUSE.